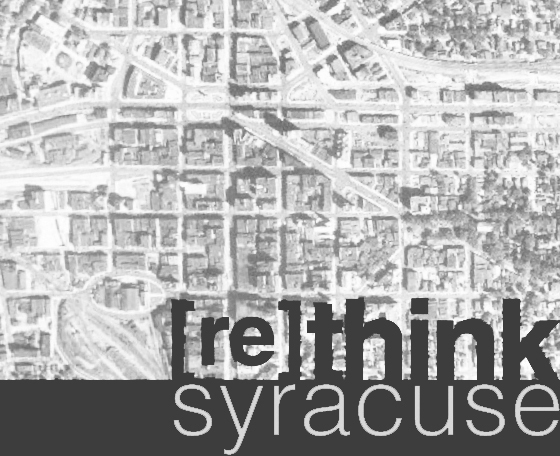 Downtown Syracuse has its fair share of vacant storefronts. We all know the story of the once-bustling Salina and Warren Street shopping corridors, and we all watch Armory Square with anticipation, hoping that the activity in that area will spill over and reactivate these former greats. We can see great new things breaking out of the traditional perceived confines of Armory Square – the new Washington Station, the Dey Building, the Pike Block – that have the potential to draw people out of their immediate comfort zone of the Square. There’s another vital cog in this expansion, yet I don’t think it quite knows it, as it's actually contributing to a void in the street activity: The Loews Building. The Loews building, home to the magnificent Landmark Theater, wraps the entire south end of the block it sits on, with street frontages on Clinton, Jefferson, and Salina streets. Although the upper floors of this building are filled with high-quality office space, apartments, and condos, the street level is puzzlingly empty… and really rather dismal looking. Over the past few years, retailers such as Joettes, Cricket, Enchanted Bazaar, and Syracuse Caramel Corn have slowly trickled out of the storefronts, and now only Clark’s Ale House remains as the sole retail tenant in the building. These street frontages are key to drawing people out of Armory and around the block onto Salina St, yet in their current state, their tattered awnings and messy display windows detract people from going any further. When pedestrians see this, they think they’ve reached the end of the “good” area, and turn back. I’ll say it again – active storefronts in this building would be the biggest asset in drawing people around to Salina. First, I must confess, I’m not well-informed about this stage expansion. I have no idea if these retail vacancies came about forcefully through refusal of lease renewal, or voluntary attrition due to the unknown future of the expansion. I’m not sure if these spaces are vacated because portions of them need to be acquired for the expanded stage space, because the spaces need to have mechanical/electrical/plumbing systems upgraded, or simply for use as a staging area for the construction. Whatever the case may be, though, the vacated storefronts need some immediate help. Why not put some temporary signage in the vacant windows that give a little background about the project? 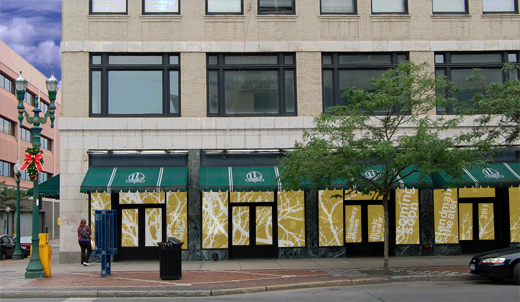 Perhaps some window wraps with local graphic artists’ work applied to the glass? And how about removing the tattered awning canvas right away so they’re not flapping in the wind, forever waiting for replacement? If this graphic art can be applied here, perhaps this could be the beginnings of a ‘floating storefront gallery’ that makes its way from storefront to storefront around the city, spurring interest at each location, with new work cycling in as it goes. Something as simple as this can relieve some of the uneasiness the passer-by feels when walking by a vacant window, and it may even have positive effects for the owner as well. For example, people from the eastern side of downtown who walk to Armory Square will see this portion of Jefferson Street as inviting and make it their primary route. This increased foot traffic would make it easier to re-lease the storefront spaces once the renovations are complete. This is only speculation, but the root of this remains the same: active storefronts – whether superficially through art or physically so through an actual retail presence – is needed on this fringe of Armory Square to begin to better connect the area’s liveliness to nearby Salina Street. Shall we put out a call for artists?